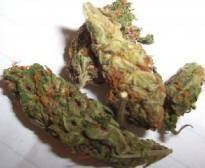 It is sometimes referred to as Alien Kush on many forums and even in dispensaries. This is a top shelf type of strain that you will get many people looking for it always. It is often subtle, but it can offer multilayered effects you might never expect. It is indica dominant, so most people would feel comfortable using it for relaxation. This is not just any other indica strain as it is still hybrid with the effect of a sativa strain. This means that you do not underestimate it. It can easily leave you high fast and keep you high for hours. This is all thanks to the genius breeding that makes the Kush highly sought after for various reasons. As for potency, it has an average THC level of 14%. This is common as most indica dominant strains would have their THC levels around that figure. In some other flowers, the THC levels were even higher. This just goes to show that you can expect to enjoy a nice joint of Space Kush any time. As for the effects, the space kush can be quite interesting. It is going to make you want to use more of it soon once you have your first test run with it. For many users, the strain gives you an impressive progression in your feelings and sensations. You might feel that you all your senses are awakened. With just a few good puffs, you should note the initial head buzz. Give it another few minutes and the high fully kicks in. You will feel surprisingly a boost in energy and euphoria. Most people who use the strain end up looking happy all the time. If you get to smoke it correctly, it will give you some sense of creativity. This is unlike other strains that would commonly make you sit on the couch the whole day. You also get the sense of your moods being uplifted and relaxed at the same time. Who would not want such a feeling? The high is estimated to stay in your body for about 2 to 3 hours. Well, that is quite a ride. When it comes to the smell, the space kush has a complex but interesting taste and smell. You can expect to notice a strong earthy and woody smell when smoking it. It might seem like you are walking through a lush forest with mixed flavors in the air. The earthiness is then mixed with a bit if sweetness to make it taste even better. Some people claim that the taste reminds you of tea. When it comes to its cultivation, it is often seen to be an excellent choice for people with all experiences and growing skill levels. Being hardy makes it easy to grow. This means that you can grow it in a different environment and it can well. It might not have a high yield, but it will be enough for you. It is now common to see patients using marijuana for various conditions. It is no surprise that some patients would consider using this type of marijuana strain. Most find it being excellent for treating depression, chronic pain, insomnia, and nausea. It could still be great for various social settings thanks to its delicious smell. This is further complemented by the feeling of happiness, relaxation, and more energy. It could still be great for those who need a bit of energy boost in the afternoon when most people are often tired.